Immigrants comprised 23 percent of all parents with young children (ages 0-8) in the United States, or almost 8.4 million in total as of 2010–14. Twenty-four percent lived below the federal poverty level, compared with 15 percent of their native-born counterparts. 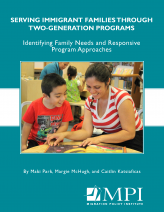 By addressing the needs of low-income parents and their young children simultaneously, two-generation programs have great potential to uplift whole families and break cycles of intergenerational poverty. Generally speaking, these programs seek to weave together high-quality early learning opportunities for children with initiatives directed at their parents, including adult education, workforce training, parenting skills, and other supports that strengthen family stability and thereby improve the children’s chances of lifelong success. Little research exists on the success of these programs in reaching immigrant families. This study, which scanned a number of large two-generation programs across the United States working with immigrant families, concludes that the field must tailor its approaches to reach a population that faces specific barriers, including limited English proficiency and low levels of formal education. Using 2010–14 data from the U.S. Census Bureau, the report compares key characteristics of immigrant and native-born parents of young children. The analysis illuminates key factors that make immigrant and refugee families an important target for two-generation programming, as well as potential challenges to effectively addressing their needs. Successful design and practice elements are then described, along with the obstacles that programs face in maintaining or expanding their services.